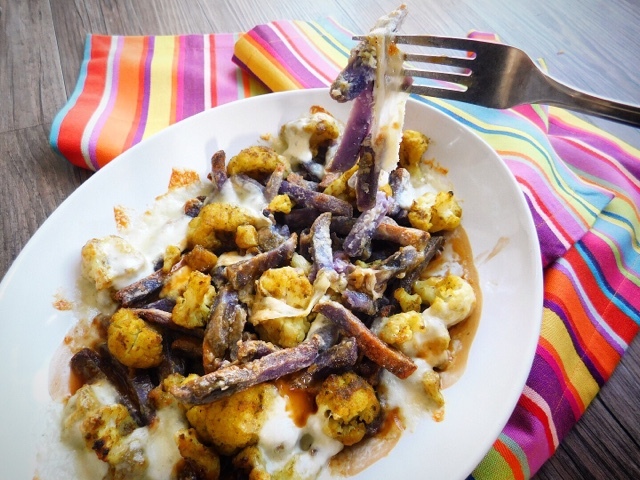 The combination of crispy purple potato chips and spicy cauliflower saturated with thick meaty gravy and topped with stringy mozzarella cheese results in a twist on Canadian Poutine which is comforting, colourful, moreish and satisfying. I collected a couple of bags of frozen goodies from my local store at Aberdeen's Beach Retail Park. As soon as I was back at my car I tipped everything out into the boot and had a good old rummage - I was way too impatient to wait until I'd driven home to find out what was in my mystery bags. I was delighted to spot a couple of pack of Millies Cookie Dough. These are a big hit with both my kids and I've previously used them to make Ice Cream Cookiewiches. The rest of the contents were completely new to me and I was particularly keen to try out some of the 'Taste of Summer' range. We've now worked our way through the Sausage Skewers, Belgian Blue Beef Steaks, Dirty Wedges and Peri Peri Spatchcock Chicken. The latter of which my son declared as being better than Nandos. 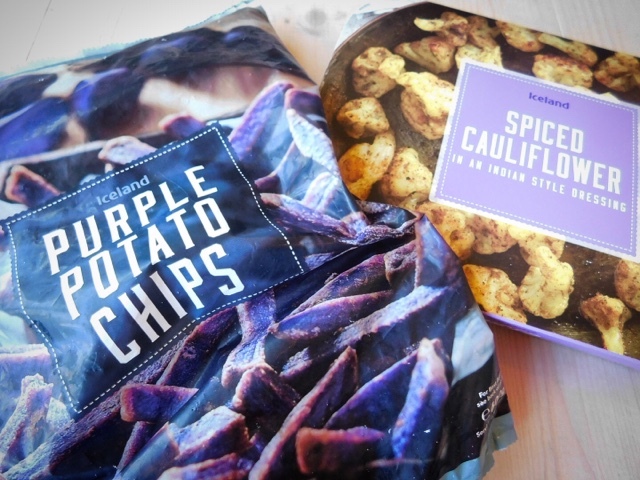 However the two products that really grabbed my attention were the Purple Potato Chips and the Spiced Cauliflower. These would be the basis of my Mystery Goody Bag Recipe, a twist on the classic comfort food that is Poutine. Poutine (pronounced putin) is a Canadian dish which we in the UK tend to think of as chips, cheese and gravy but its actually way more complex than that. The story goes that it was invented in the 1950's in in rural French speaking Quebec when a diner asked the chef to put cheese curds on top of his chips. The chef protested "Ça va faire une maudite poutine!" (It will make a damn mess!) but nonetheless he obliged and poutine was born. However the dish wasn't quite finished and the story goes that gravy was added to keep the chips warmer for longer. Whatever the truth behind their creation there's no denying that they are mighty fine. I reckon that poutine would also be amazing made with some of Bintu's African Yam Fries. To be true to the Canadian recipe the cheese needs to be squeaky cheese curds however I've substituted with the more readily available Mozzarella. As for the gravy it should be a mix of of chicken and beef. My secret ingredient to pep up any gravy, whether it be homemade or my more usual granules, is a splash of Thai Fish Sauce. It really does work wonders. Of course if you'd like to keep this dish vegetarian feel free to substitute for a veggie friendly gravy. 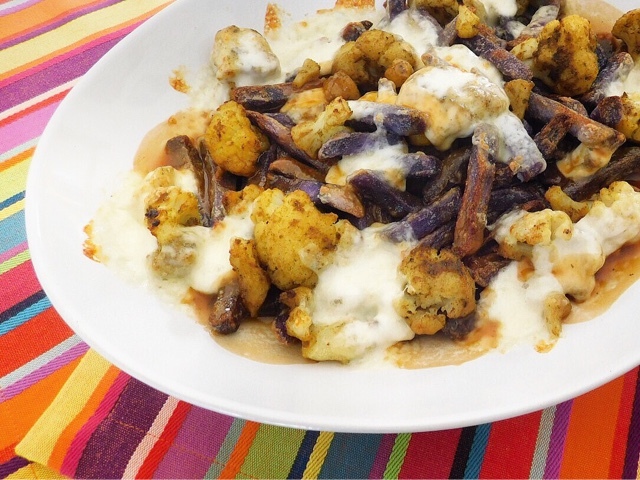 The combination of crispy purple potato chips and spicy cauliflower saturated with thick meaty gravy and topped with stringy mozzarella cheese results in a Poutine which is comforting, colourful, moreish and satisfying. Remove outer packaging from the Spiced Cauliflower and pierce film lid several times. Place foil tray on a baking sheet near the middle of the oven and cook for 15 minutes. Tip the Purple Potato Chips onto a baking tray and place on the top shelf of the oven. Cook the chips for 20 minutes, turning half way through cooking time. Meanwhile make up the gravy granules with 300ml of boiling water, stir through the Thai fish sauce and keep warm. Arrange the chips and cauliflower in a pre-warmed ovenproof serving dish. Scatter the torn Mozzarella on top and return to the oven for 5 minutes (or use a blowtorch/place under a preheated grill) until the cheese has melted and is beginning to turn golden around the edges. Pour over the gravy and serve immediately. Linking up to CookBlogShare and One Potato Two Potato. 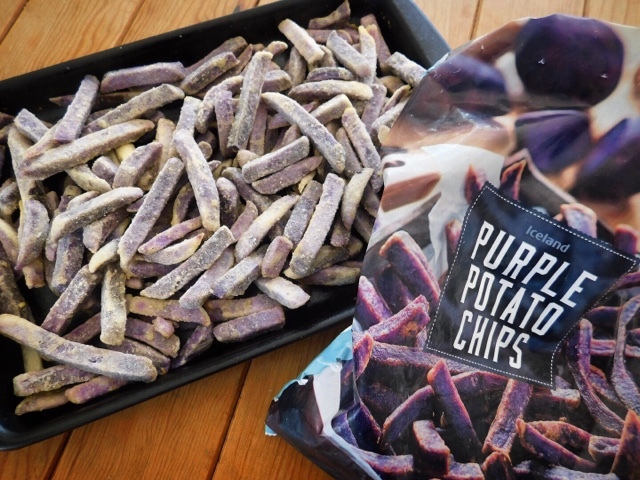 I've tried purple potatoes before but these chips are even more vibrant and such fun! I'd be that impatient too - I'd barely be out the door before my head was in the back assessing the goodies. This is a great use of some more unusual frozen food finds. Patience is definitely not one of my virtues - especially not where a goody bag of food is concerned! Poutine is so popular where I live...so many local diners have it on their menu! 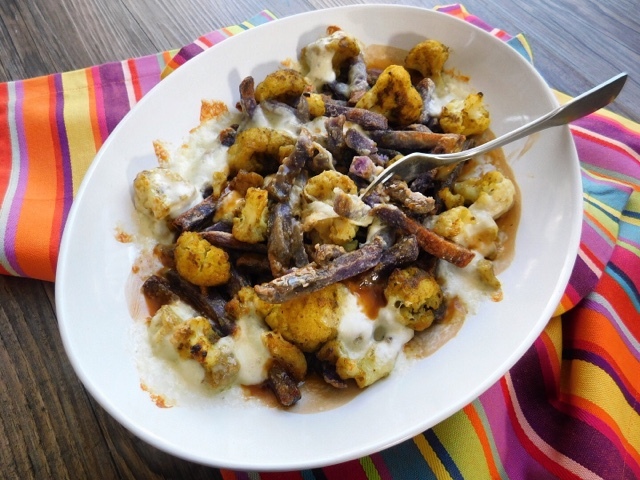 I love how this recipe has cauliflower in it - looks and sounds so good! It's really not something I've seen much on menus around here - hence I made my own! I LOVE the purple potato chips and the spiced cauliflower from Iceland Foods, I will have to give your recipe a try as it sounds very tasty. I am please to confirm that it tastes even better than it looks! I can never seem to find purple potatoes around here but they look so pretty! They seem to have become a real 'thing' of late and frozen makes them even more convenient. Woah, fish sauce! I bet that makes the gravy really pop! Honestly it really makes a huge difference - do give it a try. Nature really does have all the best colours! These are just regular potatoes as opposed to sweet but they taste great and SO convenient. They are a real talking point and I reckon they will become a freezer staple. Such fun getting a mystery bag! I love the poutine recipe. 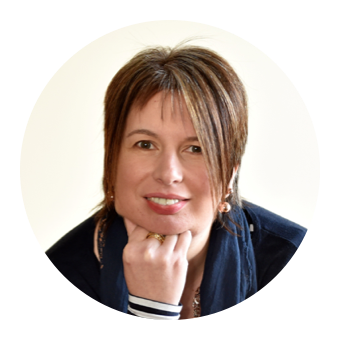 It was a great challenge and fun to try products that I might not normally choose for myself. Those chips look SO cool! Can't wait to give this one a go Claire! Anything purple is cool in my book and frozen is super cool! I've got those purple chips, so I'll try making this tonight! Excellent! Hope you enjoy as much as we did. Ohh this looks good. I've never tried the purple potato chips, it's going on my list right now! I guarantee that you won't be disappointed with them. This recipe looks and sounds very satisfying without being heavy in calories. Thanks, I need this. Comfort food all the way but oven chips rather than deep fried and you could use light Mozzarella too. Strangely my daughter was rather wary of them - but then it was love at first bite! And thanks for joining in with #OnePotato Two Potato! The only thing better than a potato is a purple potato!!! 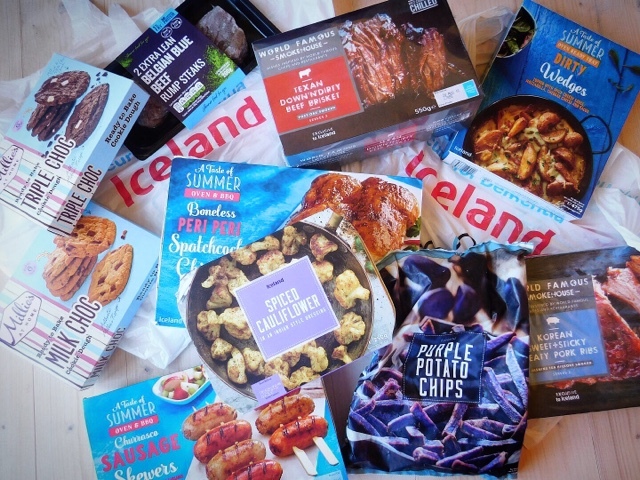 I don't have much freezer space, so don't really do frozen food, other than peas and oven chips, so now I have go to pick up those purple chips from Iceland. Thanks for introducing them to me and for such an innovative take on Poutine. I feel your pain! I only used to have a tiny freezer but now I have a huge chest freezer which I fill to the brim from Iceland.